Ashkenazi charoset, which is the charoset most American Jews are familiar with, is usually made as a chunky, sticky mixture of apples, walnuts and sweet kosher wine. 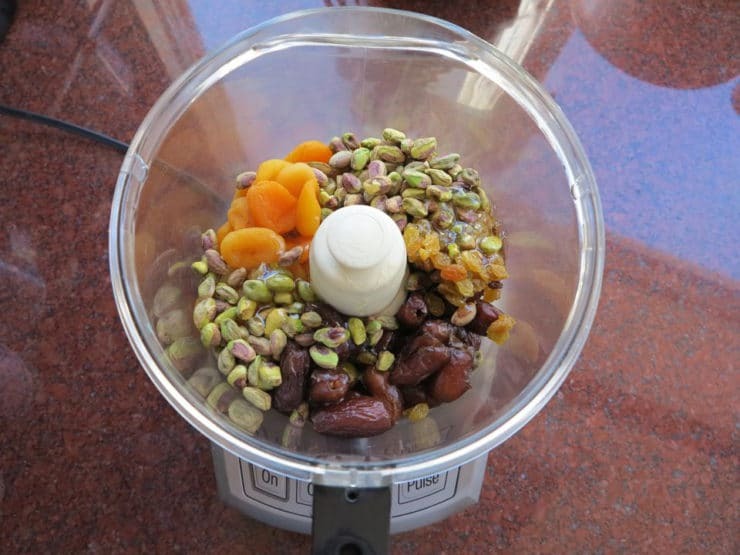 Sephardic Jews in the Middle East and Mediterranean make charoset somewhat differently, using dates and a variety of nuts in the mix (almonds, pine nuts, pistachios). Sephardic charoset may or may not include apples or wine. One of the more interesting ways charoset is served in the Middle East is in a ball or truffle form. 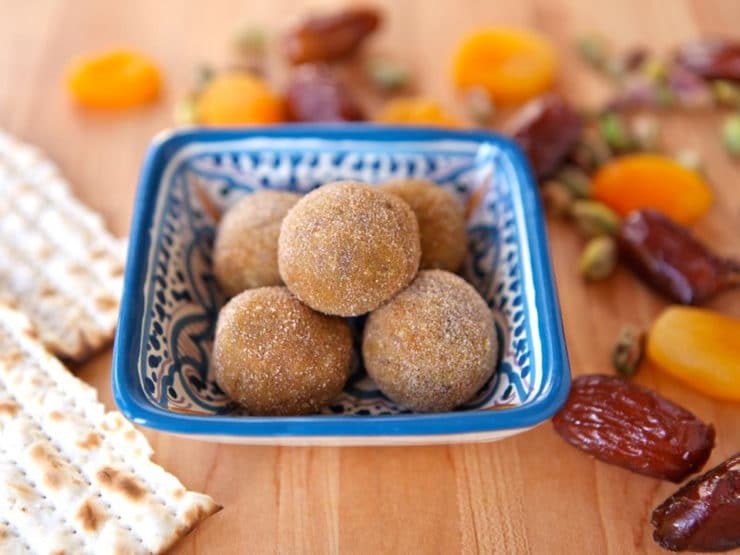 Moroccan Seders will often serve these charoset truffles rather than the spreadable charoset we are more familiar with here in America. I adapted these Sephardic Charoset Truffles from a traditional Moroccan charoset recipe that a friend shared with me. While charoset balls are usually dipped in cinnamon, I like to dip mine in cinnamon and sugar mixed together. I use pistachios because I love them, but you can substitute any kosher for Passover nut of your choice. Making the truffles is a very sticky process, so be prepared to scrub your hands afterward! 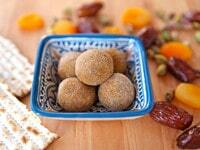 These candy-like charoset truffles can be enjoyed for Passover and year-round. If you have a smaller food processor, you will want to prepare this recipe in 2 or 3 batches. The dates are pretty sticky and can overwhelm a smaller processing blade. Note: I have updated this recipe slightly by changing the ratio of the dried fruit to half dates, half apricots. When originally posted, the ratio was 2 cups dates, 1 cup apricots. I like the truffles better with a more pronounced apricot flavor. If you’d like to make it as originally posted, use the ratio of 2 cups dates, 1 cup apricots. Enjoy! Does anyone know how long these / charoset can last in the fridge? I have a lot of leftover charoset from passover and want to make these for the second holiday this coming friday. Let me know please! Hi Davianna, these will last until Friday if you keep them refrigerated, but you may need to re-coat them with sugar because the moisture from the inside may seep into the outer layer of the truffles. I make these truffles every year, and everyone loves them. (I make them a little chunkier and less paste-like.) After every seder, my husband asks if I will make them as energy treats for Passover and all year ’round. Thanks for the great recipe and chag sameach! We made these from your recipe several years ago. We enjoyed them. The people at work wouldn’t even try them. Their loss. My family has discovered a Sephardic ancestor from long ago and we have been exploring our heritage through music, literature and food. Thank you for sharing this with us! I made these for Passover 2016 and used date spread instead of pitted dates. They were a huge hit with my Ashkenazi, half Jewish, half shiksa/goyim family. Thank you, love your recipes! Great recipe. I am a Shephardic Jew with roots from Spain, Aleppo and Colombia and this recipe was new to me and my family loved them. I used recipe for other occasions. I made a couple of alterations. Because the fruit mixture is so sweet, I made much smaller (marble-sized) balls and rolled them in ground toasted pistachios. They taste better (to me) although they’re not as pretty as the photo. Hi Norma, Tori’s assistant Ashley here. These truffles can be made up to a week in advance if stored in the refrigerator. You use unsalted pistachios, but should they be roasted or raw? Tori, I have not tried theses yet but I’m sure going to. They sound absolutely delicious, believe I’ll use the apricots also. My grown kids will love getting some of these. Thank You for the great recipes. Next year (or sooner!) I’ll make these again, but double or triple the recipe. I had to hide them to keep the snackers from grabbing “just a taste” before seder. I’ll probably make them a little smaller too so everyone can easily fit a whole one in their mouth. Terrific recipe!!!! Great Susan, glad to hear it! I had two tweaks that I made. I added ginger to the sugar/cinnamon mix. I thought it added a little kick–more depth. I also added more pistachios. I made a half batch and wound up with more than two dozen. The result is sweet, very sweet, and I can’t see making these any large. They are dime sized. Salted or unsalted pistachio nuts? Okay….I know, I am a bit A-type.I am very excited Tom ake these for Pesach this year! P.S.- I purchased unsalted….at $17.99 a lb. ! I made these last night for my seder; they are so yummy. My kids weren’t that into them, but that just means more for me and my husband. I too had some trouble getting them to blend smoothly like yours. I am wondering if my fruit was too dry, or it could be that I substituted the raisins for dried blueberries and a few cherries. I might have to make these year round as they remind me a lot of my favorite raw energy bar that sets me back about $2 every time I eat one! Thanks so much for sharing! Hi Mindy! Glad you liked them. It’s possible your fruit was too dry, or perhaps your food processor is not as powerful as mine. At any rate, you can always add a touch of water (careful– start with a teaspoon and add from there) to help blend it to a smoother texture. What would happen, do you suppose, if they were dipped in chocolate? i’ve been doing some early seder planning and just came across these. they look so amazing!! i have only ever had the ashkenazi charoset, but i think that’s going to have to change. these remind me of the homemade larabars i make with just ground dates and nuts, but i can only imagine how delicious they’d be in cinnamon sugar. Tori and readers, just an FYI… I came across a video blog for Charoset Truffles (http://www.nytimes.com/video/2013/03/15/dining/100000002118536/haroseth-truffles.html) but there was no actual recipe, so I searched for a Sephardic recipe and found this one (ironic, since I am a regular Shiksa reader for the past year!). Melissa Clark uses a little pomegranate juice to achieve the right consistency and rolled them in coconut. Tori, you never replied about the brand of food processor you use. I have a small Cuisinart, and am sure it could not handle this recipe. It may be time for me to upgrade. So what do you use/recommend? Your recipe appeared on the 4Zion website, (with attribution) but they left out the dates from the ingredient list. Just thought you’d like to know that its making the rounds. I made your recipe last Spring and it was really good. My pistachios were a bit rancid tasting, so the second batch I substituted almonds. Thanks for sharing your recipe. Every year the in-laws (who are secular Jews) do a Thanksgiving potluck, and I decided (since they have a food processor) to fix these. I added a 1/2 cup of dried cranberries and a couple pieces of candied ginger, since everything is better with ginger. Tasting it, it lacked “sparkle”, and 2 teapoons of orange liquor did it. Since I had a bunch of pistachios left, we ground them fine and mixed with cinnamon and a touch of sugar for the coating. It was a double batch, and I’m worried (after we all tasted them) that 60 or so balls won’t be enough for the meal. Very yummy. What a fun modification Robin! I’ll have to try it that way soon. Thanks for writing! Shalome, Tori! I just made these and they are super easy AND super tasty!!! 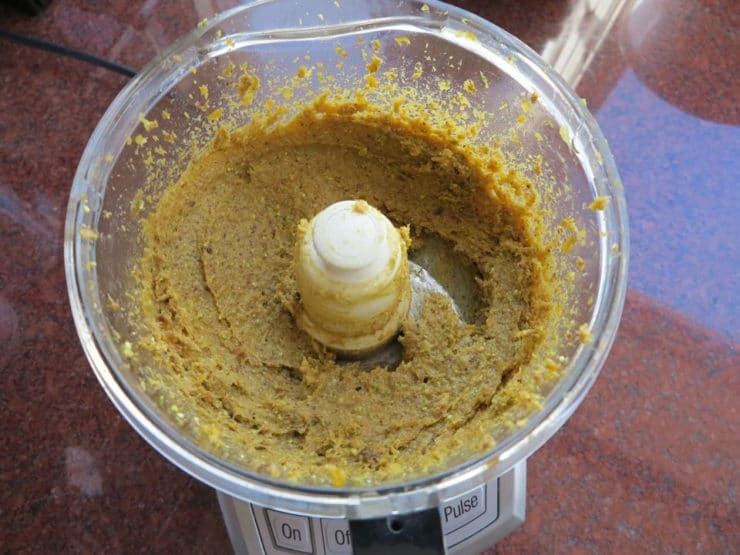 My Cuisinart food processor seemed to have a hard time….even when I broke up the ball you mentioned…smelled like the motor was burning…so I left mine at a little chunkier consistency. Wondering what brand machine you have? PS I just got back from a tour of Israel! Ahmazing!!!! For many years, I worked retail, which meant crazy hours. It was really hard for me to find time to cook any sort of holiday goodies for the huge family seders that my now mother-in-law hosts. Now that I have the time, I want to impress her and all my new mishpacha! I made these for our 2nd night seder and they were a hit. I didn’t use a food processor, but chopped all the ingredients Ashkenazi charoset-style. Since you could see all the chunks of dried fruit and pistachio, they were very colorful and festive. I made them in the early afternoon and left them out – by the time of the seder, they had firmed up a little and tasted fantastic. I think I might use a little less honey and sugar the next time as they were quite sweet, but so so good. Your blog is adorable and thanks for the awesome recipe! Made them for our Seders. Everyone loved them. Yum! I’m very sorry to post a negative review, but these were so disappointing I feel the need to comment. My mother-in-law and I both independently found this recipe and made them. Everyone agreed that they were not good. We like all of the ingredients separately, yet somehow together we thought they were disgusting. My brother-in-law called them “the eleventh plague.” At least we all had a great laugh about it. I very much enjoy your blog, and I hope you are having a wonderful holiday. I made these as a substitute for Easter Candy this year. Also had the food processor die mid-pulse, leaving me with something more like “Charoset Trail Mix Balls.” No matter, just rolled them into as non-lumpy balls as possible (thank you for the wet hands tip; indispensable. ), covered them in a wee bit (1/2 what you recommended) of sugar and a whole lot more cinnamon. Lent’s officially over, but we’ve decided to ration them out, as they’re totally addictive. Thank you so much for this recipe! loved this recipe – i omitted the honey by mistake, and found that it was sticky enough to hold together without it – I also dusted the outside with cinnamon (no sugar), and they were still terrific. thanks! These look wonderful, my mom would definitely have loved them. I’ll make them for my family during Pesach, thanks! 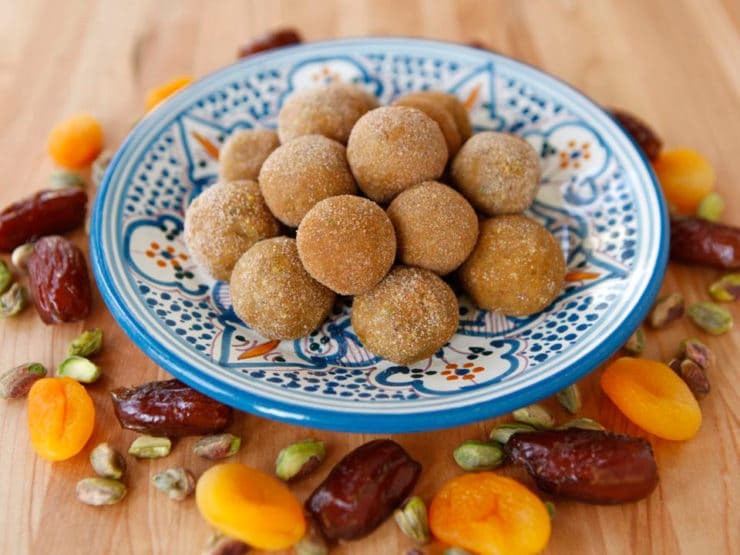 Can the sephardic charoset truffles be frozen? I would not freeze them Jill, but they will last quite a long time in the refrigerator– up to a week at least. I made them with walnuts instead of pistachios and they are yummy! Is there a good substitute for apricots? My husband and I don’t really care for them in many recipes. Hi Tabby! You can substitute all dates. Raisins or dried apple slices would work, too. These are really good! Two out of three kids love them. They are quick and easy to make. And a nice change of pace from Ashkenazi charoset. Thank you for all of the interesting recipes can’t wait to try them all! I am very excited to make this on Friday! Thank you, looks like the most delish recipe for Charoset out there! I made these for our Sisterhood Pesach potluck. Almost everyone there (except me!) was Sephardic and I had the hit dish of the group! Thanks so much!! You had me at pistachio, you sealed the deal with the dates. Sound delicious. We did a charoset bar one year- made about 5 different kinds- and had a nice break while everyone got up and picked their selections and came back for their ‘korech’. ANYHOW, I am forced into working in advance, as I will be flying home hours before hosting at my house (yes, crazy). Maybe not dip them at all and just do a single dip before serving? Chill or store at room temp? I can not wait to try this dish, they look yummy, they are very healthy for you too. Thank so much for sharing, I am looking forward to more healthy recipes. When I have to deal with dates and raisins, I just run them through the meat grinder attachment for my kitchen aid. It deals with them in a flash. I’m going to make these by pushing all of the ingredients thought the meat grinder. Oh, I love your suggestion. I will be doing that. I love apricots too, but don’t have any of those at the moment. When I can get my hands on some, I’ll try that, too. This recipe looks great-I can’t wait to try it next week. How far in advance can I make these? How do I store them? Hi Alisa, I wouldn’t make them too far ahead. They do last a long time at room temperature, but if they sit for longer than 24 hours they become moist and sticky. Leave them out, uncovered, at room temperature– keep them in a single layer on a plate lined with paper towels. You can make them 1-2 days ahead; you may need to re-dip them in the cinnamon sugar a few hours before the Seder to freshen them. Mmm, yum! Your recipe is very much like mine except that I used figs instead of dates and I add an apple to the mix. It helps with the thickness of the charoset when processing. Made a double batch. I think I’ll try walnuts the next time. These would be wonderful on cracker or French bread with brie cheese any time during the year. Recipe is definetly a “winner”! Oh yummy! These look amazing! I’m allergic to nuts though. Can I make them without? Can I add something else for crunch? Are sunflower seeds kosher for passover? Renee, thanks for the heads up, I’m going to make a note of that in the blog. I have a heavy duty processor, and I can imagine a smaller processor might be overwhelmed by all those dates! Sunflower seeds would work great as a substitute. My fiance’s family is half Sephardic, so we do enjoy kitniyot for Passover. For us, seeds would be a suitable substitute. You could also try subbing shredded coconut for the nuts– it’s not a traditionally Sephardic ingredient, but I bet it would be tasty and provide the needed texture (it would make the truffles a bit spongier than using the nuts). If I have any other ideas I’ll let you know. Good luck! For my second Shiksa Passover I needed a great desert. Unfortunately my tiny food processor could not handle the stickyness of the dates and apricots so I ended up having to mush most of it by hand! It’s almost midnight and I just finished a batch for tomorrow night. 🙂 They’re YUMMY! I made about 50, btw, because I did teaspoon sized balls. These look awesome! Just to clarify, are you using dried apricots or fresh in this recipe? 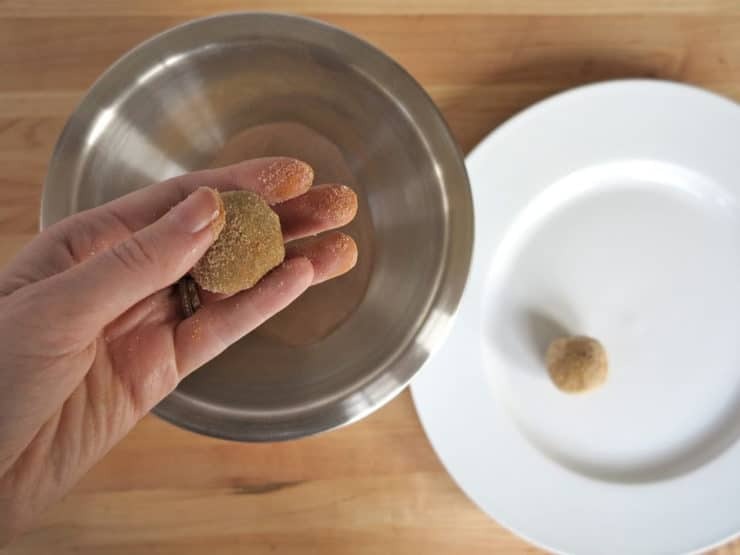 Hey Rachel, use dried apricots– thanks for catching that, I updated the blog! I’ve never seen these before! how cool. Do you break them down and spread them onto the matzoh or just eat them by themselves with your fingers? I am not jewish but love to cook so I might try to cook this and if my father was alive he would definitely cook it thanks for the great recipes.